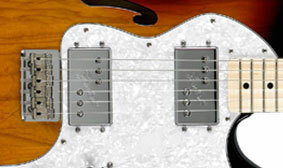 Adventurous guitarists started hot-rodding their Telecasters in the late '60s and early '70s with big-sounding humbucking pickups that lent new style and swagger to rock music. The Classic Series '72 Telecaster Thinline brings it all back as an authentic evocation of its semi-hollow 1972 ancestor, including dual Fender Wide Range humbucking pickups, a large pickguard, Stratocaster® bridge and more. A favorite of players from '70s rock to modern U.K. alt-rock and much more. 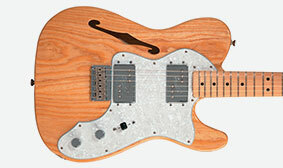 The most notable hallmark of this modern Telecaster Thinline model is its comfortably lightweight semi-hollow body, which also contributes much to its resonant tonal character and authentically evokes its late-1960s and early-’70s ancestors. 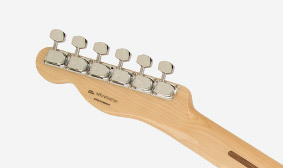 This specialized ’72 Telecaster model features the nicely authentic touch of sealed tuners stamped with the stylized capital "F" from the classic Fender script logo.